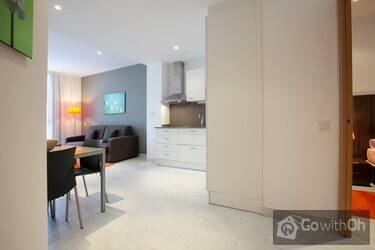 This contemporary 2nd floor apartment of 40m2 with lift access has been optimised to receive 4 people comfortably. 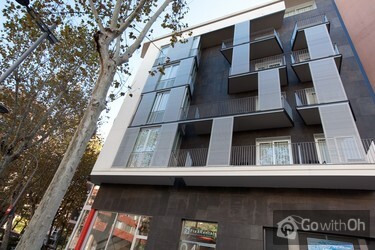 Located in a brand new residence (September 2011), that has in the area of Sants close the station. 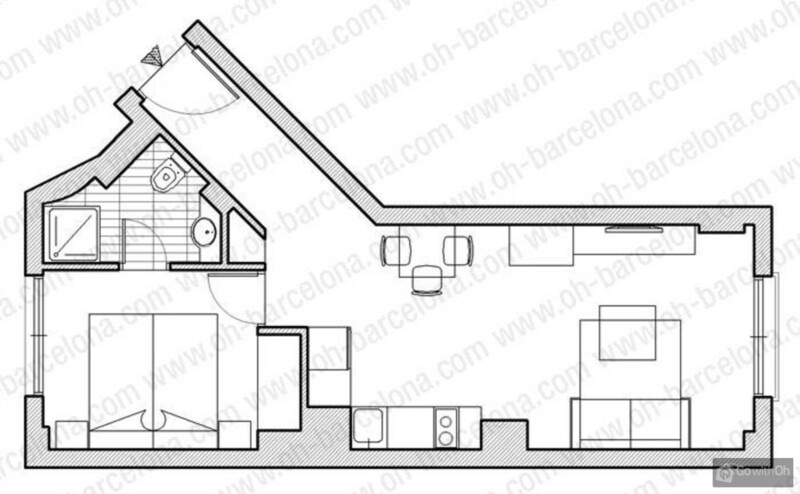 This property allows easy access to all of Barcelona, and is just 2 streets from the Metro Station Entença, taking you to Paseo de Gracia in 2 stops. This flat is made up of a spacious living room with double sofa bed, plasma TV, satellite channels and free WIFI internet access. The kitchen is open plan and equipped with a microwave, hob, fridge freezer, dishwasher and washer/dryer. The bedroom suite includes 2 twin beds that can be made up into a double bed, a large wardrobe with a safe for your valuables. In the bathroom is a good sized shower for relaxing after a long day of shopping, a bidet, a wash basin and a heated towel rail. 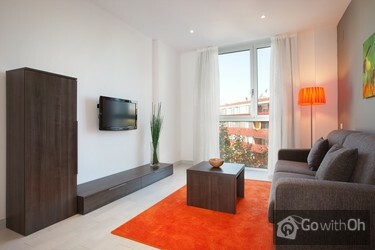 This apartment is heated and air-conditioned. Check-in between 21:00 and 00:00 may be available on request and is subject to an additional fee of 30. Please send us the details of your arrival time in advance. Cot available free of charge on request. You can leave your luggage at the check-in office during office hours (Monday to Friday 10:00-13:00 and 15:00-19:30). On the weekend and on public holidays it is not possible to store luggage. 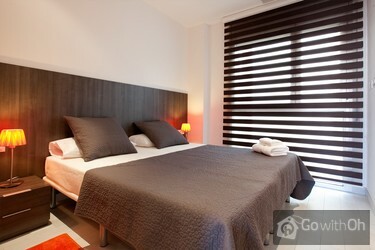 Parking available close to the apartment for an amount of 20 per night but with for minimum of 3 nights. For all bookings over 8 nights, the property owner can offer an extra cleaning for free, if you arrange it in advance. Appartamento moderno, pulito, confortevole, silenzioso. Letto e divano comodi (il letto un po' troppo duro). Per chi vuol cucinare sarebbe più comodo se ci fossero 4 fuochi invece di due. Il bagno non ha il bidé cosa a cui noi italiani non ci abitueremo mai. Con un bambino poi è sempre molto ...scomodo. Doccia molto confortevole. L'ascensore è parlante e poiché il pianerottolo che affaccia su di esso è molto piccolo e le porte molto ravvicinate, ogni volta che arriva al piano la voce si sente anche un po' nella camera. Per chi ha il sonno leggero può essere scomodo. E' ben collegato con la metro e la stazione a circa 500-600 mt. Nel complesso siamo stati molto bene. 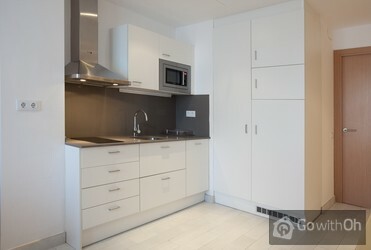 EL APARTAMENTO NOS PARECIO MUY LINDO, MODERNO,COMODO, Y TRANQUILO.EL BARRIO AGRADABLE,Y RESPONDIENDO A TODAS LAS NECESIDADES, CAFES, RESTAURANTES, FARMACIAS, Y COMERCIOS DE TODO TIPO,TAMBIEN SUPERMERCADOS.USAMOS EL METRO DE LA ESTACION DE SANTS, HAY QUE CAMINAR UN POCO, PERO SE LLEGA FACIL. EN ...RESUMEN NUESTRA ESTADIA EN EL LUGAR FUE MUY BONITA. La llegada y entrega del dto. muy traumatica. Se debe esperar al Turista en el dto. y no hacerlo ir a recibir un codigo y pagar la cuenta completa en la porteria de un edificioen la Gran Via (ni siquiera una oficina,todo el tramite de parados) Es una gran pena,pues la mercaderia que ofrecen es de primera. 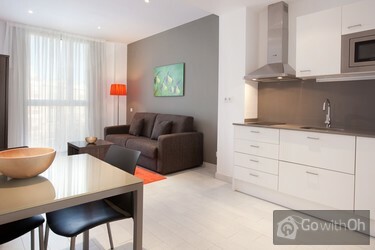 Nous avons trouvez l'appartement très cosy, on s'y sentait comme chez nous, l'appartement est bien situé nous sommes près de tout centre commercial de l'illa diagonal, la gare de sants, le métro, le train, même le bus touristique. Je recommanderais volontiers ce logement .